Prosecutors are seeking a two-year prison term for ex-Sheriff Lee Baca for conspiring to obstruct a federal grand jury investigation into civil rights abuses and corruption within Los Angeles County jails, but the defense is asking for a sentence of home detention, court papers obtained Tuesday show. Baca, 74, was convicted March 15 of obstruction of justice and two other federal charges for his role in the scheme to thwart the FBI probe into inmate mistreatment in the jails he ran and of lying to the bureau. 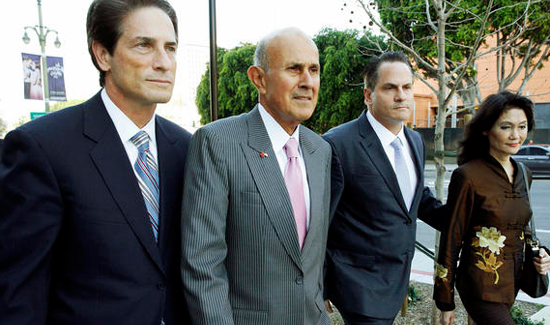 After about two days of deliberations, a criminal jury in downtown Los Angeles — the second to hear the case — found that Baca authorized and condoned a multi-part scheme that now has resulted in the conviction of 10 former members of the Sheriff’s Department. During his two trials, prosecutors described Baca as being the top figure in the conspiracy, which also involved his right-hand man, Paul Tanaka, and eight deputies who took orders from the sheriff. In helping derail the federal probe, Baca “abused the great power the citizens of Los Angeles County had given him,” while false statements made during a sworn interview with investigators was a “deliberate attempt to deflect blame and place it entirely on the shoulders of others within his department,” the prosecution wrote in pre-sentencing documents. Normally, the government would recommend a prison sentence within a range of about three and four years for the convictions. But due to Baca’s age and cognitive condition, “the interests of justice will not be served by defendant spending many years behind bars in a severely impaired state,” the document states. In its papers, the defense cited Baca’s decades of public service, diagnosis of early stage Alzheimer’s disease and “peripheral” role in the conspiracy to support a probationary term in home detention with community service.